Interferons (IFNs) are a group of signaling proteins made and released by host cells in response to the presence of several viruses. In a typical scenario, a virus-infected cell will release interferons causing nearby cells to heighten their anti-viral defenses. Interferon type I: All type I IFNs bind to a specific cell surface receptor complex known as the IFN-α/β receptor (IFNAR) that consists of IFNAR1 and IFNAR2 chains. The type I interferons present in humans are IFN-α, IFN-β, IFN-ε, IFN-κ and IFN-ω. In general, type I interferons are produced when the body recognizes a virus that has invaded it. They are produced by fibroblasts and monocytes. However, the production of type I IFN-α is prohibited by another cytokine known as Interleukin-10. Once released, type I interferons bind to specific receptors on target cells, which leads to expression of proteins that will prevent the virus from producing and replicating its RNA and DNA. Overall, IFN-α can be used to treat hepatitis B and C infections, while IFN-β can be used to treat multiple sclerosis. Interferon type II (IFN-γ in humans): This is also known as immune interferon and is activated by Interleukin-12. Furthermore, type II interferons are released by Cytotoxic T cells and T helper cells, type 1 specifically. However, they block the proliferation of T helper cells type two. The previous results in an inhibition of Th2 immune response and a further induction of Th1 immune response, which leads to the development of debilitating diseases such as multiple sclerosis. IFN type II binds to IFNGR, which consists of IFNGR1 and IFNGR2 chains. All interferons share several common effects: they are antiviral agents and they modulate functions of the immune system. Administration of Type I IFN has been shown experimentally to inhibit tumor growth in animals, but the beneficial action in human tumors has not been widely documented. A virus-infected cell releases viral particles that can infect nearby cells. However, the infected cell can protect neighboring cells against a potential infection of the virus by releasing interferons. 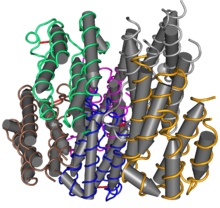 In response to interferon, cells produce large amounts of an enzyme known as protein kinase R (PKR). This enzyme phosphorylates a protein known as eIF-2 in response to new viral infections; the phosphorylated eIF-2 forms an inactive complex with another protein, called eIF2B, to reduce protein synthesis within the cell. Another cellular enzyme, RNAse L—also induced by interferon action—destroys RNA within the cells to further reduce protein synthesis of both viral and host genes. Inhibited protein synthesis impairs both virus replication and infected host cells. In addition, interferons induce production of hundreds of other proteins—known collectively as interferon-stimulated genes (ISGs)—that have roles in combating viruses and other actions produced by interferon. They also limit viral spread by increasing p53 activity, which kills virus-infected cells by promoting apoptosis. The effect of IFN on p53 is also linked to its protective role against certain cancers. Many viruses have evolved mechanisms to resist interferon activity. They circumvent the IFN response by blocking downstream signaling events that occur after the cytokine binds to its receptor, by preventing further IFN production, and by inhibiting the functions of proteins that are induced by IFN. Viruses that inhibit IFN signaling include Japanese Encephalitis Virus (JEV), dengue type 2 virus (DEN-2) and viruses of the herpesvirus family, such as human cytomegalovirus (HCMV) and Kaposi's sarcoma-associated herpesvirus (KSHV or HHV8). Viral proteins proven to affect IFN signaling include EBV nuclear antigen 1 (EBNA1) and EBV nuclear antigen 2 (EBNA-2) from Epstein-Barr virus, the large T antigen of Polyomavirus, the E7 protein of Human papillomavirus (HPV), and the B18R protein of vaccinia virus. Reducing IFN-α activity may prevent signaling via STAT1, STAT2, or IRF9 (as with JEV infection) or through the JAK-STAT pathway (as with DEN-2 infection). Several poxviruses encode soluble IFN receptor homologs—like the B18R protein of the vaccinia virus—that bind to and prevent IFN interacting with its cellular receptor, impeding communication between this cytokine and its target cells. Some viruses can encode proteins that bind to double-stranded RNA (dsRNA) to prevent the activity of RNA-dependent protein kinases; this is the mechanism reovirus adopts using its sigma 3 (σ3) protein, and vaccinia virus employs using the gene product of its E3L gene, p25. The ability of interferon to induce protein production from interferon stimulated genes (ISGs) can also be affected. Production of protein kinase R, for example, can be disrupted in cells infected with JEV. Some viruses escape the anti-viral activities of interferons by gene (and thus protein) mutation. The H5N1 influenza virus, also known as bird flu, has resistance to interferon and other anti-viral cytokines that is attributed to a single amino acid change in its Non-Structural Protein 1 (NS1), although the precise mechanism of how this confers immunity is unclear. Unconfirmed results suggested that interferon eye drops may be an effective treatment for people who have herpes simplex virus epithelial keratitis, a type of eye infection. There is no clear evidence to suggest that removing the infected tissue (debridement) followed by interferon drops is an effective treatment approach for these types of eye infections. Unconfirmed results suggested that the combination of interferon and an antiviral agent may speed the healing process compared to antiviral therapy alone. When used in systemic therapy, IFNs are mostly administered by an intramuscular injection. The injection of IFNs in the muscle or under the skin is generally well tolerated. The most frequent adverse effects are flu-like symptoms: increased body temperature, feeling ill, fatigue, headache, muscle pain, convulsion, dizziness, hair thinning, and depression. Erythema, pain, and hardness at the site of injection are also frequently observed. IFN therapy causes immunosuppression, in particular through neutropenia and can result in some infections manifesting in unusual ways. Furthermore, others may have made observations on interferons before the 1957 publication of Isaacs and Lindenmann. For example, during research to produce a more efficient vaccine for smallpox, Yasu-ichi Nagano and Yasuhiko Kojima—two Japanese virologists working at the Institute for Infectious Diseases at the University of Tokyo—noticed inhibition of viral growth in an area of rabbit-skin or testis previously inoculated with UV-inactivated virus. They hypothesised that some "viral inhibitory factor" was present in the tissues infected with virus and attempted to isolate and characterize this factor from tissue homogenates. Independently, Monto Ho, in John Enders's lab, observed in 1957 that attenuated poliovirus conferred a species specific anti-viral effect in human amniotic cell cultures. They described these observations in a 1959 publication, naming the responsible factor viral inhibitory factor (VIF). It took another fifteen to twenty years, using somatic cell genetics, to show that the interferon action gene and interferon gene reside in different human chromosomes. The purification of human beta interferon did not occur until 1977. Y.H. Tan and his co-workers purified and produced biologically active, radio-labeled human beta interferon by superinducing the interferon gene in fibroblast cells, and they showed its active site contains tyrosine residues. Tan's laboratory isolated sufficient amounts of human beta interferon to perform the first amino acid, sugar composition and N-terminal analyses. They showed that human beta interferon was an unusually hydrophobic glycoprotein. This explained the large loss of interferon activity when preparations were transferred from test tube to test tube or from vessel to vessel during purification. The analyses showed the reality of interferon activity by chemical verification. The purification of human alpha interferon was not reported until 1978. A series of publications from the laboratories of Sidney Pestka and Alan Waldman between 1978 and 1981, describe the purification of the type I interferons IFN-α and IFN-β. By the early 1980s, genes for these interferons had been cloned, adding further definitive proof that interferons were responsible for interfering with viral replication. Gene cloning also confirmed that IFN-α was encoded by a family of many related genes. The type II IFN (IFN-γ) gene was also isolated around this time. ^ De Andrea M, Ravera R, Gioia D, Gariglio M, Landolfo S (2002). "The interferon system: an overview". European Journal of Paediatric Neurology. 6 Suppl A (6): A41–6, discussion A55-8. PMID 12365360. ^ Levy DE, Marié IJ, Durbin JE (December 2011). "Induction and function of type I and III interferon in response to viral infection". Current Opinion in Virology. 1 (6): 476–86. doi:10.1016/j.coviro.2011.11.001. PMC 3272644. PMID 22323926. ^ Espinosa V, Dutta O, McElrath C, Du P, Chang YJ, Cicciarelli B, Pitler A, Whitehead I, Obar JJ, Durbin JE, Kotenko SV, Rivera A (October 2017). "Type III interferon is a critical regulator of innate antifungal immunity". Science Immunology. 2 (16): eaan5357. doi:10.1126/sciimmunol.aan5357. PMC 5880030. PMID 28986419. ^ Moiseeva O, Mallette FA, Mukhopadhyay UK, Moores A, Ferbeyre G (April 2006). "DNA Damage Signaling and p53-dependent Senescence after Prolonged β-Interferon Stimulation". Molecular Biology of the Cell. 17 (4): 1583–92. doi:10.1091/mbc.E05-09-0858. PMC 1415317. PMID 16436515. ^ Haller O, Kochs G, Weber F (October–December 2007). "Interferon, Mx, and viral countermeasures". Cytokine & Growth Factor Reviews. 18 (5–6): 425–33. doi:10.1016/j.cytogfr.2007.06.001. PMID 17683972. ^ Samarajiwa SA, Forster S, Auchettl K, Hertzog PJ (January 2009). "INTERFEROME: the database of interferon regulated genes". Nucleic Acids Research. 37 (Database issue): D852–7. doi:10.1093/nar/gkn732. PMC 2686605. PMID 18996892. ^ Li D, Sun J, Liu W, Wang X, Bals R, Wu J, Quan W, Yao Y, Zhang Y, Zhou H, Wu K (October 2016). "Rig-G is a growth inhibitory factor of lung cancer cells that suppresses STAT3 and NF-κB". Oncotarget. 7 (40): 66032–66050. doi:10.18632/oncotarget.11797. PMC 5323212. PMID 27602766. ^ a b c d Lin RJ, Liao CL, Lin E, Lin YL (September 2004). "Blocking of the alpha interferon-induced Jak-Stat signaling pathway by Japanese encephalitis virus infection". Journal of Virology. 78 (17): 9285–94. doi:10.1128/JVI.78.17.9285-9294.2004. PMC 506928. PMID 15308723. ^ a b Alcamí A, Symons JA, Smith GL (December 2000). "The vaccinia virus soluble alpha/beta interferon (IFN) receptor binds to the cell surface and protects cells from the antiviral effects of IFN". Journal of Virology. 74 (23): 11230–9. doi:10.1128/JVI.74.23.11230-11239.2000. PMC 113220. PMID 11070021. ^ Miller JE, Samuel CE (September 1992). "Proteolytic cleavage of the reovirus sigma 3 protein results in enhanced double-stranded RNA-binding activity: identification of a repeated basic amino acid motif within the C-terminal binding region". Journal of Virology. 66 (9): 5347–56. PMC 289090. PMID 1501278. ^ Chang HW, Watson JC, Jacobs BL (June 1992). "The E3L gene of vaccinia virus encodes an inhibitor of the interferon-induced, double-stranded RNA-dependent protein kinase". Proceedings of the National Academy of Sciences of the United States of America. 89 (11): 4825–9. Bibcode:1992PNAS...89.4825C. doi:10.1073/pnas.89.11.4825. PMC 49180. PMID 1350676. ^ Paolicelli D, Direnzo V, Trojano M (14 September 2009). "Review of interferon beta-1b in the treatment of early and relapsing multiple sclerosis". Biologics. 3: 369–76. PMC 2726074. PMID 19707422. ^ Cooksley WG (March 2004). "The role of interferon therapy in hepatitis B". MedGenMed. 6 (1): 16. PMC 1140699. PMID 15208528. ^ Ishikawa T (October 2008). "Secondary prevention of recurrence by interferon therapy after ablation therapy for hepatocellular carcinoma in chronic hepatitis C patients" (Free full text). World Journal of Gastroenterology. 14 (40): 6140–4. doi:10.3748/wjg.14.6140. PMC 2761574. PMID 18985803. ^ a b c Wilhelmus KR (January 2015). "Antiviral treatment and other therapeutic interventions for herpes simplex virus epithelial keratitis". The Cochrane Database of Systematic Reviews. 1: CD002898. doi:10.1002/14651858.CD002898.pub5. PMC 4443501. PMID 25879115. ^ Bhatti Z, Berenson CS (February 2007). "Adult systemic cat scratch disease associated with therapy for hepatitis C". BMC Infectious Diseases. 7: 8. doi:10.1186/1471-2334-7-8. PMC 1810538. PMID 17319959. ^ Jamall IS, Yusuf S, Azhar M, Jamall S (November 2008). "Is pegylated interferon superior to interferon, with ribavarin, in chronic hepatitis C genotypes 2/3?". World Journal of Gastroenterology. 14 (43): 6627–31. doi:10.3748/wjg.14.6627. PMC 2773302. PMID 19034963. ^ Nagano Y, Kojima Y (October 1954). "[Immunizing property of vaccinia virus inactivated by ultraviolets rays]". Comptes Rendus des Séances de la Société de Biologie et de ses Filiales (in French). 148 (19–20): 1700–2. PMID 14364998. ^ Ho M, Enders JF (March 1959). "AN INHIBITOR OF VIRAL ACTIVITY APPEARING IN INFECTED CELL CULTURES". Proceedings of the National Academy of Sciences of the United States of America. 45 (3): 385–9. PMC 222571. PMID 16590396. ^ Tan YH, Tischfield J, Ruddle FH (February 1973). "The linkage of genes for the human interferon-induced antiviral protein and indophenol oxidase-B traits to chromosome G-21". The Journal of Experimental Medicine. 137 (2): 317–30. doi:10.1084/jem.137.2.317. PMC 2139494. PMID 4346649. ^ Weissenbach J, Chernajovsky Y, Zeevi M, Shulman L, Soreq H, Nir U, Wallach D, Perricaudet M, Tiollais P, Revel M (December 1980). "Two interferon mRNAs in human fibroblasts: in vitro translation and Escherichia coli cloning studies". Proceedings of the National Academy of Sciences of the United States of America. 77 (12): 7152–6. Bibcode:1980PNAS...77.7152W. doi:10.1073/pnas.77.12.7152. PMC 350459. PMID 6164058. ^ Taniguchi T, Fujii-Kuriyama Y, Muramatsu M (July 1980). "Molecular cloning of human interferon cDNA". Proceedings of the National Academy of Sciences of the United States of America. 77 (7): 4003–6. Bibcode:1980PNAS...77.4003T. doi:10.1073/pnas.77.7.4003. PMC 349756. PMID 6159625. ^ Cantell K (1998). The story of interferon: the ups and downs in the life of a scientis. Singapore; New York: World Scientific. ISBN 978-981-02-3148-4. ^ Tan YH, Armstrong JA, Ke YH, Ho M (September 1970). "Regulation of cellular interferon production: enhancement by antimetabolites". Proceedings of the National Academy of Sciences of the United States of America. 67 (1): 464–71. Bibcode:1970PNAS...67..464T. doi:10.1073/pnas.67.1.464. PMC 283227. PMID 5272327. ^ Laghari ZA, Chen SN, Li L, Huang B, Gan Z, Zhou Y, Huo HJ, Hou J, Nie P (2018). "Functional, signalling and transcriptional differences of three distinct type I IFNs in a perciform fish, the mandarin fish Siniperca chuatsi". Developmental and comparative immunology. 84 (1): 94–108. doi:10.1016/j.dci.2018.02.008. PMID 29432791. ^ Boudinot P, Langevin C, Secombes CJ, Levraud JP (2016). "The Peculiar Characteristics of Fish Type I Interferons". Viruses. 8 (11). doi:10.3390/v8110298. PMC 5127012. PMID 27827855.